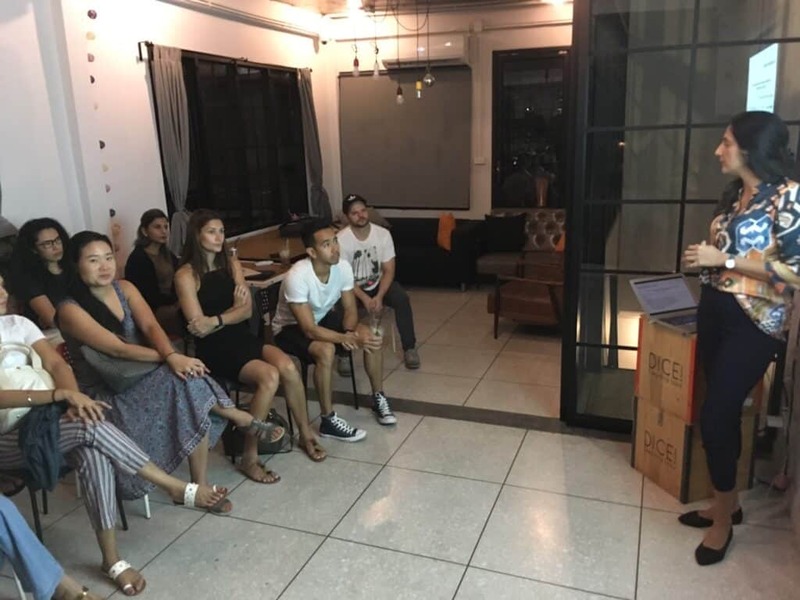 Last Wednesday we had a great workshop – Nutrition for Fat Loss at the best cafe in Ari – Dice Cafe. 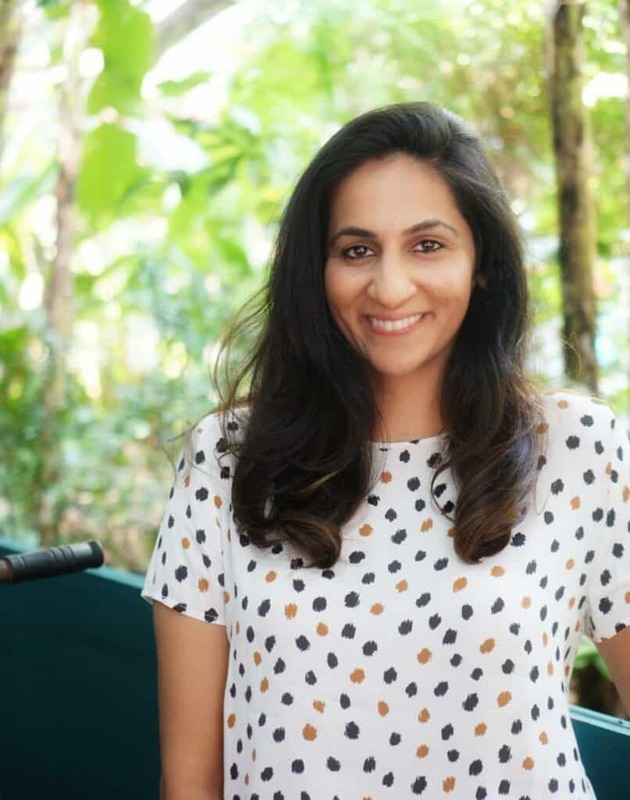 If you haven’t heard, our speaker, Dr. Priya Khorana is a Doctor of Education on Nutrition and she shared her experiences and studies with us on what she most recommend to the people she cares most about when it comes to nutrition for fat loss. And the verdict is…The MyPlate Method + Gradual Caloric Deficit. MyPlate Method is actually really simple. Fill half a plate with Veggies. 1/4 with Protein. 1/4 with Starch. Dr. Priya also discusses studies or lack of studies on effects of extreme and overly advertised diet, the Keto Diet. The promise of the keto diet is to starve yourself from carbohydrates so your body run on “ketones” as fuel. Many have claimed that they are more focused and energized when their bodies run on ketones, however, long term studies have yet to exist. On the other hand, there are studies that proofed the effects on being on starvation mode, such as hormonal imbalances, and growth of body hair. Other popular diets such as vegan, Paleo, and intermittent fasting were also discussed. We ended the workshop with Q&A sessions and answered questions from the participants. Some popular questions were how to prepare meals if you’re busy, where to find quality local food that are affordable, is it ok to skip breakfast, and is it ok to just eat fruits. Overall, it was a great night. Participants left home with information they can take actions on. And Dr.Priya is already getting feedback on the next workshop topics! What should be the next topic? Help Dr.Priya brainstorm by commenting below! 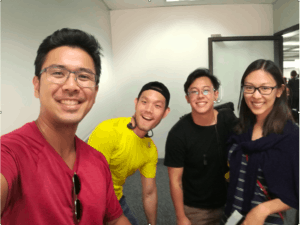 I got a special blog post this time. It’s one of the rare occasions when we get to meet an OPEX Head Coach, Michael Bann! I’m excited to have learned many useful concepts and wanted to share a simplified version with all of you. Let’s get to it! But hold on a sec. Before we start with the actual seminar, let’s begin with where this course was, and who was travelling with me! 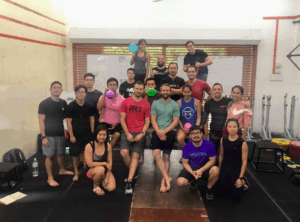 Our seminar was hosted at PushMore Fitness in Kuala Lumpur, Malaysia. 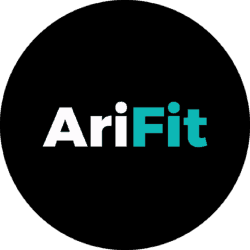 And I have with me my dear wife, plus two of our youngest brightest apprentice coaches who are in our Professional Coach Development Program here at Ari School of Fitness. 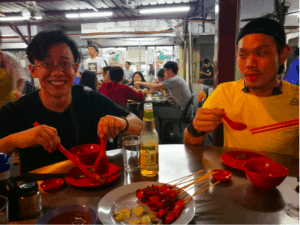 And of course Malaysia is known for FOOD! So eating is a MUST! Michael went through his background and various techniques of analysing and improving movement patterns. Sorry for all the technical terms. There really aren’t a simpler way to explain that. Anyways. It was eye-opening! Our dear coaches and I were able to learn the commonalities ofvarious paradigms. And the big thing is the effects on Physiology with regards to muscle pain. We rarely thought about that. As the usual school of thoughts are focused heavily on just anatomy. Breathing and chewing food can fix pain? It’s hard to believe, but evidences and success stories don’t lie! 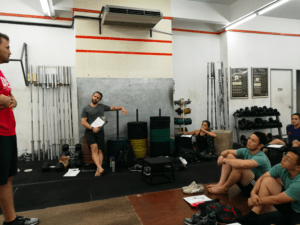 We also went into various assessments, coaching techniques, and corrective exercises. 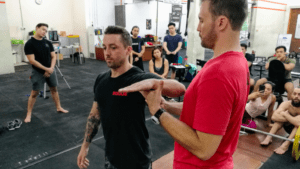 Some of the biggest things we learned were the use of bands in correcting exercises, as well as several breathing techniques! Before we left, we learned to putting it all together – from assessment to the program design process. And that concludes our seminar! Our coaches and I had a great time learning and meeting other knowledgable passionate coaches! The 2017 CrossFit regionals competition do not use any barbell in the workouts. Our thoughts? We absolutely LOVE it! 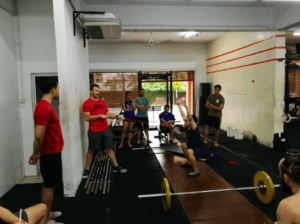 Barbell is a lot of fun to train with. 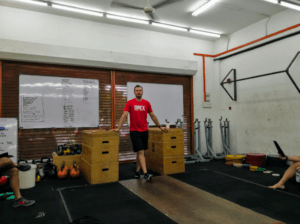 We want to master movements like front squats, clean and jerk, and snatches. But it’s also important to balance it with other things. 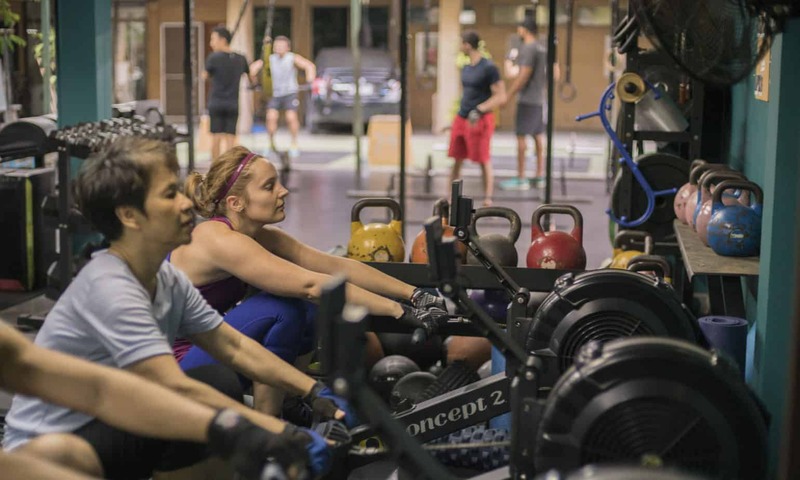 In the past 5 years, barbell has taken a dominant role in the fitness world. 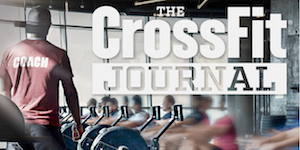 When a big organisation like CrossFit tames it down a notch, we absolutely agree! Talking from a functional fitness standpoint, barbell also does not look much like anything we find in our life. 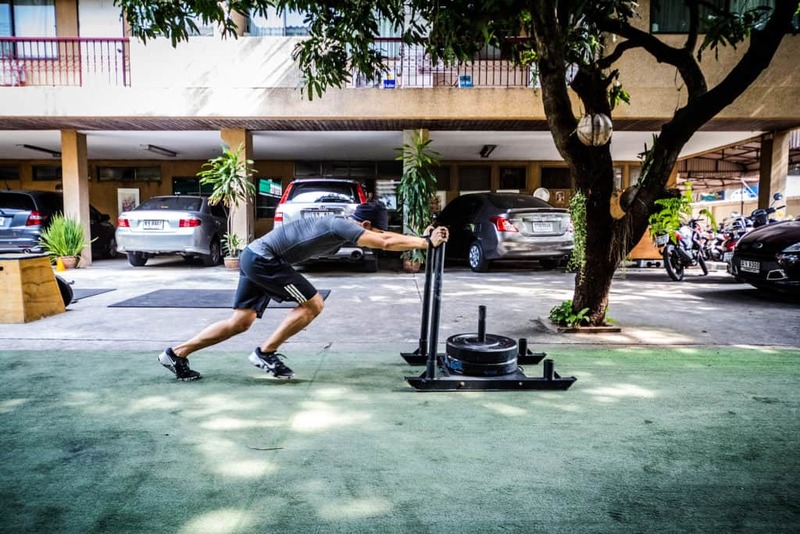 Objects like sandbags, sleds, kettlebells, and dumbbells are more like real life objects. Final Thoughts : For the magic to happen, train for heavier loads, longer distance, and taking less rest. It doesn’t always have to be barbells.